The Magicians, Lev Grossman, Viking Adult, 2009, ISBN 978-0670020553, 416pp. At some point in the development of a writer, you have to stop reading and start writing. Many writers find it difficult to write in their own style if they are simultaneously reading something very stylistic, as most writers are mimics–a thing that comes in quite handy when you are trying to write about characters very unlike you, but awkward in the case I’m describing where you unconsciously start copying another writer’s style. This isn’t confined to writers, of course, as musicians, painters, and most likely artists of any other stripe find that to create their own original work, they have to isolate themselves so that the influences aren’t quite so immediate. Which makes it quite difficult for writers to work certain jobs, the worst being that of book critic or reviewer. Lev Grossman is the book critic for the news magazine, Time, and this is his second novel. I didn’t read his first, Codex, but glancing at it recently in the bookstore, it was obviously marketed to the same folks who enjoyed the Dan Brown books (I can’t say it’s derivative of Brown, as I didn’t read the thing, as I said). 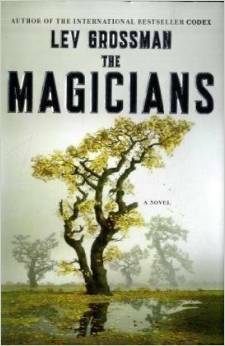 This one, The Magicians, is very obviously a derivative of J.K. Rowling’s Harry Potter books crossed with C.S. Lewis’s Narnia, and I might have dismissed it offhand if I hadn’t seen some comments from people whose opinion I trust that said it was worthwhile. While they mentioned that it was “Harry Potter for adults,” they noted that it transcended its source material. Rather than transcend, I think The Magicians is actually a meta-fictional commentary on its influences, while retaining enough of an interesting story line that if you don’t care about thinking in such ways, you don’t have to. Grossman clearly takes on themes that Rowling avoided in her books, including much more believable turns on alienation and sexuality. There’s also an implied criticism of C.S. Lewis’s simplistic moralistic and structured adventures, and a devil of a villain that comes close to being original except that I think I’ve seen all of his special effects in horror/fantasy movies of the last decade. I enjoyed the book quite a lot, but I would hesitate to suggest it to lovers of either of its major influences if they can’t stand a bit of criticism, which seems appropriate in context, given Grossman’s day job.